Chest congestion is the accumulation of fluid and mucus in the airways and lungs that leads to feelings of heaviness, pressure, and tightening in the chest. It typically results from respiratory tract infections such as the common cold, flu, or bronchitis, and from inflammatory lung conditions like asthma, chronic obstructive pulmonary disease (COPD), and pulmonary fibrosis. Chest congestion home remedies are an easy and affordable way to clear up the mucus and fluid build-up. If the coughing and wheezing persists and becomes problematic, seek medical advice from your doctor. Signs of chest congestion can include coughing after eating, wheezing, chest pain and discomfort, shortness of breath, runny nose, and dizziness. Below are 11 easy chest congestion home remedies. Research has indicated that steam inhalation can help clear up mucociliary transport time faster than medication, especially in patients with chronic pulmonary disease. When steam is inhaled, it breaks up mucus to get it out and relieve congestion. But it only really works if done properly. The steam helps break down mucus, allowing it to be released with much more ease. To clear chest regions from congestion, fill a bowl with hot water and add a few drops of peppermint or eucalyptus oil. Place your face over the bowl, cover your head with a towel (which also covers the bowl so that no steam escapes), and inhale. Drinking fluids when you’re ill has a number of benefits, which mostly relate to hydration. Excess mucus and fever can put increased demands on your body and an increased fluid intake helps meet those demands. For congestion specifically, water can help thin the mucus in the chest and make coughing up phlegm easier. 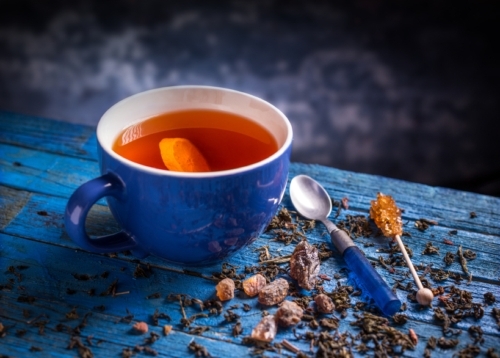 Most fluids will help relieve congestion, but hot tea has added benefits because of the temperature. Hot water, tea, coffee, and other heated beverages can help break up mucus and thin it out so that breathing and coughing is all easier. Honey tea: Honey is nature’s best defense against coughs and chest congestion, particularly Manuka honey, a dark honey with a strong taste. Honey is a natural antibacterial that helps reduce infections in the respiratory tract. Lemon tea: Lemon has large amounts of the vitamin C your body needs to fight off infections. To make the drink, add a tablespoon of honey and the juice of half a lemon to hot water, stir, and drink. Ginger tea: Ginger is an anti-inflammatory herb, so it often helps to reduce chest congestion. Chicken noodle soup is hot, easy to chew, and has all the tools to help loosen the mucus in the lungs. It’s generally pretty thin so it goes down easily, and it has enough nutrition that could provide some defense against fatigue and other cold symptoms, according to some studies. But its main benefits come from the fact that it helps you stay hydrated, and when hot, it breaks up mucus. An added benefit is that it may help soothe a sore throat if you’ve been coughing. Gargling with warm salt water can help remove mucus from the respiratory tract. Many people strongly believe in the benefits of gargling salt water to clear chest congestion. The act of gargling may help to loosen mucus in the throat, making it easier to dispel. Experts suggest that adding salt to warm water can pull the congestion from your chest and improve symptoms. As a natural antibacterial agent, salt may also help kill the bacteria related to certain infections. Add a teaspoon of salt to one glass of warm water. Gargle the mixture a few times per day for two or three days. When sleeping, use an extra pillow to elevate your head. This will help prevent mucus from building up overnight. Sleeping is the most difficult time for people suffering chest congestion because mucus and phlegm settle and cause irritation and blockage. Elevating your head will reduce these issues. Some people find steaming invasive and suffocating, so try a heating pad instead. Place a hot water bottle or heating pad against your chest and leave it there for 15 minutes. The heat will help break down fluids in the chest. Dairy is not a good idea when you’re suffering with chest congestion, coughs, and stuffy noses because it causes mucus production. The last thing you need is more mucus, so avoid dairy until fully recovered. Drinking apple cider vinegar may help clear up chest congestion and break down mucus, as well as strengthen the immune system. Once again, hydration and mucus loosening are accomplished by increasing your intake of fluids. Apple cider vinegar, as suggested by some, may even have some added benefits. While there isn’t a lot of concrete research showing its direct effect on congestion, the solution may help limit the inflammation that could be causing chest congestion. This may have something to do with its acetic acid content. Stir well and drink two to three times per day. Turmeric is a spice that has curcumin in it, which helps break down mucus so it can then be expectorated. You can add it to foods or add the spice to hot water as a drink. In fact, you can even add it to any of the hot drinks mentioned earlier. Mix two to three teaspoons of turmeric into a glass of hot milk. Mix two teaspoons of turmeric with hot water. Heat one cup of water to a low boil. Mix one tablespoon of turmeric and two tablespoons of apple cider vinegar into the water. Boil for another two minutes. Drink twice a day (it may taste slightly disgusting). The sulfur and quercetin in onions may also aid in loosening the mucus causing chest congestion. The anti-microbial properties may help battle the infection that is promoting the congestion as well. Extract the juice from a medium-sized onion. Add two tablespoons of honey and water and four tablespoons of fresh lemon juice. Stir well and heat until lukewarm. Drink three or four times per day. Essential oils may help promote better breathing, open airways, and break up phlegm leading to chest congestion. Peppermint and tea tree oils are said to work best while also helping to act as anti-inflammatory and antibacterial medication to fight infection. Some other useful essential oils for combatting chest congestion include castor oil, coconut oil, and tea tree oil. You can diffuse these in a room, or to treat acute congestion, apply as a topical rub or inhale by steaming. Use two to three drops of eucalyptus or tea tree or peppermint oil. Add one tablespoon of castor or coconut oil. Mix in your choice of oil with a carrier oil. Apply the mixture to the neck, back, chest, and sinus areas. Do this every night before bed. Vapor rub products like “Vicks VapoRub” can offer quick and easy relief for a congested chest. No cooking, boiling, or effort is required. If you’re in a pinch for time, try massaging some vapor rub into your chest and throat area. Eat a healthy, nutrient-dense diet rich in vegetables and fruit. Don’t smoke or drink too much alcohol. Avoid cheese and dairy (until congestion has subsided). Use a humidifier or essential oil diffuser. Sleep or lie down with your head slightly elevated. Get rid of potential allergens. Consult your doctor to learn why you’re congested, or at least to rule out serious conditions that could cause it. If you’ve ever experienced a runny nose or congested chest, you know it gets worse at night. There are copious amounts of mucus and phlegm and it can be very difficult to breathe. This has nothing to do with the time of the day or the stars, however; the reason why it worsens has more to do with gravity. Lying down provides an ideal environment for mucus to pool and collect in the back of your throat. This makes breathing difficult while also providing plenty of discomfort. Ways to limit this congestion include applying a vapor rub, doing a steaming session, or using one of the other remedies mentioned above. You can also fight back against gravity by propping your head up on a pillow so that mucus has a harder time collecting in your throat. In addition, you can look to change the climate in your bedroom. If the air is too dry, it can aggravate an irritated nose and throat, so perhaps a humidifier can help. Managing congestion at night can be accomplished by using any of the techniques outlined above. Taking a hot shower can also help open up the airways before getting into bed in a slightly inclined position. It’s also a good idea to keep a little “safety kit” on your bedside table in case you feel congested in bed. A glass of water, some vapor rub, or other medications to help are a good idea to keep close by. Running a diffuser with essential oils like peppermint oil may help, too. It’s possible that congestion can be triggered by allergies, which is why it’s important to keep your bedding clean. Dust mites are a common trigger for allergic reactions and congestion, so try and wash your sheets weekly in hot water. Allergens like dust mites, food allergies, products, etc. As you can see, congestion can come from something as simple as dust mites in your sheets or a serious, even chronic, health condition. Getting a diagnosis as to why you’re experiencing congestion is essential, because in some cases, these natural remedies may not be effective. Steaming, for example, can be dangerous for people with asthma. Before treating congestion, know what’s causing it. Many of the conditions responsible for chest congestion are serious and potentially deadly infections. Coughing fits, usually accompanied by chest pain and heaviness—like something is in there. Once again, these accompanying symptoms are typically the result of a flu, cold, allergies, or other infection. A congested chest means your body is fighting an invader of some sort. Chest congestion is not a health condition on its own, but rather an immune response to a bigger problem. It is a symptom itself, and it’s important to have that underlying cause diagnosed by a doctor. Once you have a diagnosis, try one of the simple treatments listed above to help open up your airways, improve your sleep, and help manage the symptoms so you can get back to your daily life. Sruthika, “Natural Remedies for Chest Congestion,” DIY Remedies; https://diyremedies.org/chest-congestion/, last accessed March 3, 2018. Malcom, X., “7 Home Remedies to Relieve Chest Congestion,” Medisys Health Network; http://medisyshealth.org/newsletter/?p=1783, last accessed March 3, 2018. Vora, S., et al., “Effect of steam inhalation on mucociliary activity in patients of chronic pulmonary disease,” Indian Journal of Chest Diseases & Allied Sciences, Jan.-Mar. 1993; 35(1):31-4; https://www.ncbi.nlm.nih.gov/pubmed/8225430, last accessed March 3, 2018. Adams, A., “Does Drinking Water Help Chest Congestion?” Livestrong, October 3, 2017; https://www.livestrong.com/article/480208-does-drinking-water-help-chest-congestion/, last accessed March 3, 2018. Bruso, J., “The Best Soup for Bronchitis,” Livestrong, October 3, 2017; https://www.livestrong.com/article/539805-the-best-soup-for-bronchitis/, last accessed March 3, 2018. Ferguson, A., “6 Effective Home Remedies for Chest Congestion,” Think Healthiness, November 27, 2014; http://www.thinkhealthiness.com/home-remedies-for-chest-congestion/, last accessed March 3, 2018. Collins, S., “How to Get Rid of Chest Congestion,” 1800 Remedies, November 4, 2017; http://www.1800remedies.com/chest-congestion/, last accessed March 3, 2018. Kukreja, K., “Home Remedies To Get Rid Of Chest Congestion,” Style Craze, October 23, 2017; http://www.stylecraze.com/articles/effective-home-remedies-for-chest-congestion/#EssentialOil, last accessed March 3, 2018. Guthrie, L., “Why Your Cough Symptoms Get Worse at Night,” Everyday Health, last updated September 13, 2017; https://www.everydayhealth.com/hs/cold-and-flu-relief/nighttime-cough/, last accessed March 3, 2018. Griffin, R., “8 Tips for Nighttime Cough Relief,” WebMD, reviewed by Melinda Ratini, DO, MS on July 2, 2015; https://www.webmd.com/cold-and-flu/features/nighttime-relief#2, last accessed March 3, 2018. “12 Natural Home Remedies For Chest Congestion Relief,” Live a Little Longer; https://www.livealittlelonger.com/home-remedies-for-chest-congestion-relief/, last accessed March 3, 2018. Annambhotla, S., “19 Best Home Remedies For Chest Congestion,” MavCure; https://mavcure.com/home-remedies-chest-congestion/, last accessed March 3, 2018. “Home Remedies for Chest Congestion,” Top 10 Home Remedies web site; http://www.top10homeremedies.com/home-remedies/home-remedies-chest-congestion.html, last accessed March 7, 2016. “Best Home Remedies for Chest Congestion,” My Health Tips web site; http://www.myhealthtips.in/2013/09/best-home-remedies-for-chest-congestion.html, last accessed March 7, 2016. “How to Naturally Get Rid of Chest Congestion,” Livestrong web site; http://www.livestrong.com/article/262246-how-to-naturally-get-rid-of-chest-congestion/, last accessed March 7, 2016. “How to Clear Chest Congestion,” WikiHow web site; http://www.wikihow.com/Clear-Chest-Congestion, last accessed March 7, 2016. “20 DIY Home Remedies for Chest Congestion,” Home Remedies for Life web site; http://homeremediesforlife.com/chest-congestion/, last accessed March 7, 2016. “How to Get Rid of Chest Congestion: Best Home Remedies for Chest Congestion,” NLDA web site; http://www.nlda.org/how-to-get-rid-of-chest-congestion-best-home-remedies/, last accessed March 7, 2016.